Over the years, I've collected quite a few gadgets to make stitching easier. Some of them work well; others are a disaster and I scratch my head and think "How could someone make money out of designing something that is so hopeless?" I once bought a rotating cutting mat, which every time you turned it, the mat flew out of the base! If you turned it fast, the mat would be like a frisbee and end up metres away! Needless to say I asked for my money back on that one and I recently ordered an Olfa which hopefully will arrive soon and work as it is meant to! I don't know about you, but sometimes I'm just too lazy to scrabble around in a cupboard or drawer to get that 'time-saving', 'labour-saving' gadget out and end up doing the job the old-fashioned 'by hand' way. 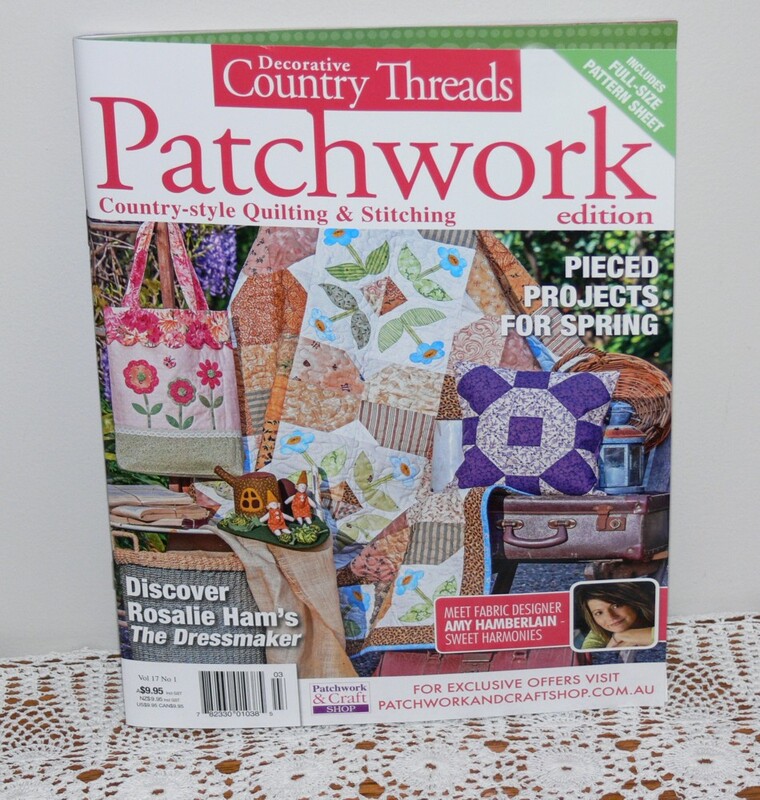 One gadget that I do use a bit more is my Accuquilt Go Cutter. I do confess though, that even with this great machine, I sometimes just grab the rotary cutter and mat to cut binding strips or the like. However, when it comes to petal and flower shapes, it really comes in to its own for me. 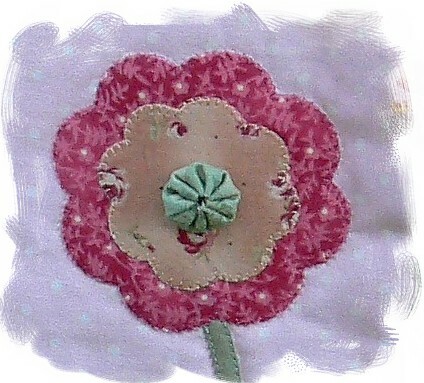 I have used the Rose of Sharon Dye 1 and the Crazy Petals to make these flowers. I especially love also that it cuts felt really well and I have a new design in the pipeline using lots of little flowers and circles of felt. 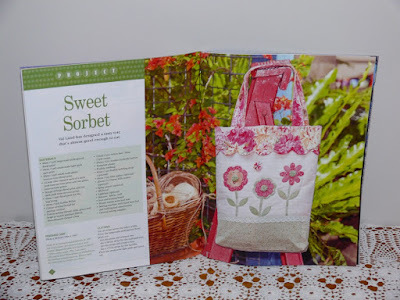 The flowers you see above are on my Sweet Sorbet bag which I taught at the Creative Craft Retreat last year. Our Insurance repairs on our garage have all gone smoothly. Our residence has been a hive of activity with trucks coming and going, tradesmen in and out, and our new ceiling installed ready for painting. As a former administrator, I have been impressed with the way they have co-ordinated the garage-door to be removed and then reinstalled a few hours later, an electrician to make live wires safe and then later back to install the power-point and light fitting, the company to deliver plasterboard at the right time, truck to remove the rubbish arriving on plan, all with little interruption to our days. 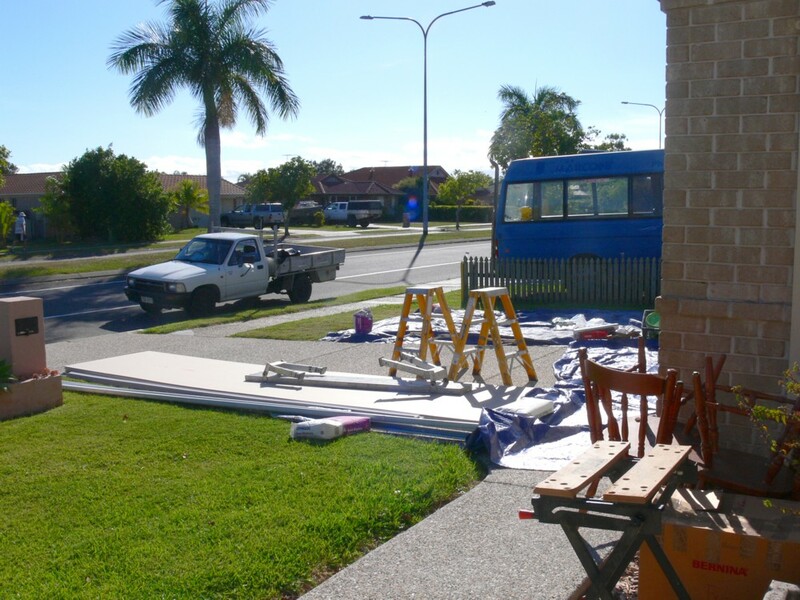 Now we await the painter and then the plumber to put in new guttering. In between checking what was happening, I managed to get two projects ready to send off to editors. One of them had a total mind of its own and didn't end up anything like my initial idea! I've learned to just go with the flow when that happens and hope the editor likes the end result! Funny how we buy these gadgets and still use the old fashion way....I love the Sweet Sorbet bag....nice magazine spread. Good morning Val, Someone had recommended I get a rotating mat so your comments about spinning and flying off had me chuckling. I have only recently been acquainted with cutting mats and rotary cutters having always used scissors in the past. I'm getting to really like the speed of the rotary for, as you say, bindings or other straight cutting. I am impressed with Go Cutter though, I have often wondered how folks get such consistent and neat designs. Lovely. I am not a gadget girl at all, even in the kitchen. 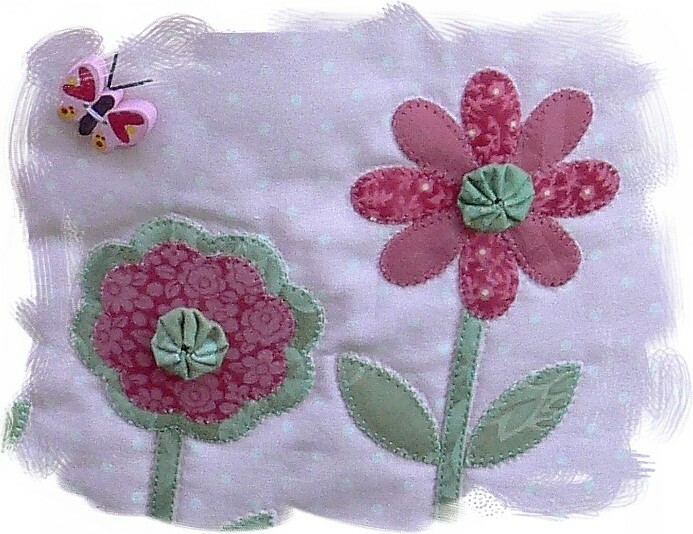 I tend to mainly hand piece and hand applique with only some things done on my sewing machine. 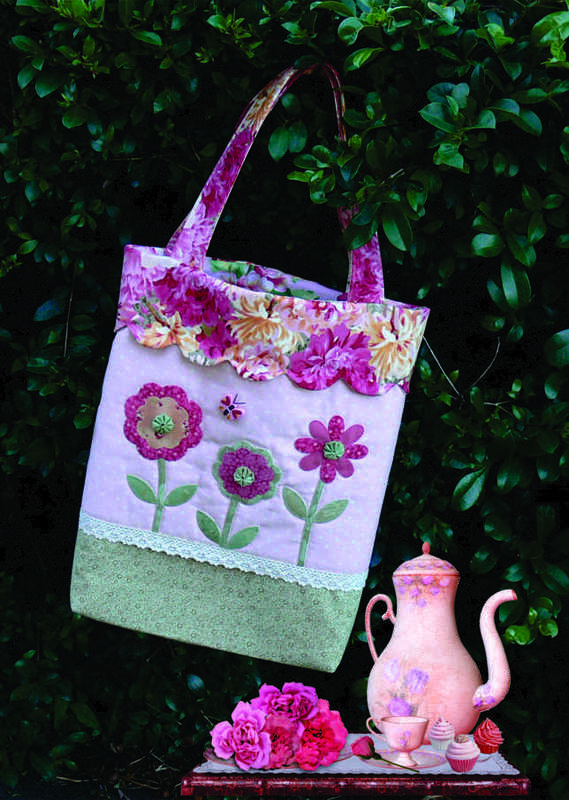 My handy things are 1/4 inch ruler, needle threader, pigment pens, Frixion pens, fusible webbing, stick on thimbles and lots of zip lock bags. 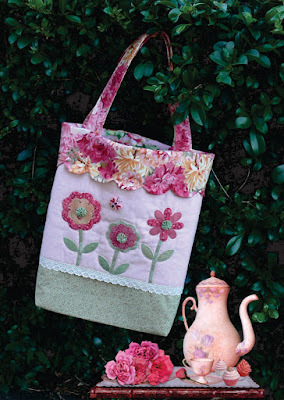 Pretty applique there and bag. You are so productive.